Back 40 Farm, Dancing Dog Farm, Gaia’s Breath, Hemlock Hill, Red Barn Bakery, Blooming Hill Farm, Marcia Tucker, Western CT Craftsmen, Jaw Workshop, Farming 101, Shearwater Coffee Roasters, Red Bee Honey, Sea to Table, Blue Moon Acres, Ridberg+, Chaljeri Farm, Beltane Farm, Cato Corner Farm, Social Comments, Deidre Mannix, and Mountain Rose Herbs. 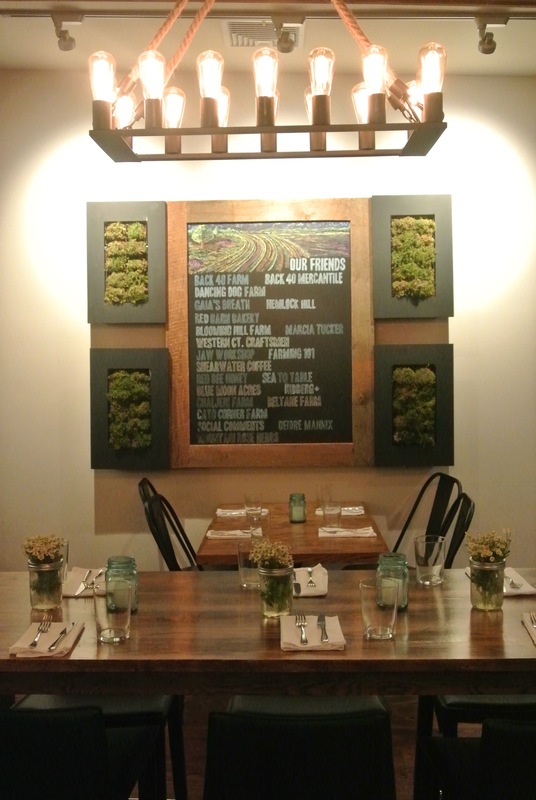 This is the impressive list of suppliers that are proudly displayed at Back 40 Kitchen, a new rustic, quaint farm-to-table spot in Greenwich. Yup, this list lets you know that when it comes to the farm part of farm-to-table, Back 40 Kitchen ain’t messin’ around. They take their ingredients very seriously, and without giving too much away, it shows . . . BIG TIME! And, speaking of ingredients, you could say that they are very careful about not only what gets into their kitchen, but what comes out on your plate . . . or in your glass, for that matter. The majority of their food comes from local sources, whether it’s CT or NY. Then, Chef George DeMarsico transforms those ingredients into something greater, making apps and entrees from scratch without even a single whisper of gluten. The same approach can be found behind the bar, as Jennifer DeMarsico (Manager and cocktail curator) creates the drinks and ingredients inside of them from “scratch” like her cherry syrup that we mention in the next section. So what this all adds up to was an amazing first experience there this past Saturday. Let’s break it down for you one tasty bite (and sip) at a time. Drinks here at Back 40 Kitchen are organic, whether you’re talking about a beer, a wine, or even their cocktails. Our intention was to have some of their wine when we arrived with our friends Christine and Andrew Dominick of Food Dudes, but after our first cocktails, our plans went out the door. Kristien started with the Grapefruit, Honey, Jalapeño Margarita which had a nice tartness from the grapefruit and a gentle burn from the Red Bee Honey infused with jalapeño. Dan decided to try something different and ordered the Mezcal Garden made with Nuestra Soledad Mezcal, Lime Juice, and Cold Pressed Green Juice. It was herby, bright, and vibrant with the mezcal peeking through nicely. And, while it wasn’t Dan’s favorite drink from the night, he could appreciate it for what it was: a green and fresh kinda version of a Bloody Mary. Andrew ordered the Whiskey Lullaby made with Koval Four Grain Whiskey, OJ, Lavender Syrup, and Housemade Chamomile Tincture. He freaking loved it, and Christine loved her Rhum Punch, too. It’s made with Agricole Rhum, Lime Juice, Lemon Juice, Blood Orange Liquor, and Housemade Cherry Syrup. The liquor is actually made with fermented sugar cane juice, so you get some floral notes from that and the Cherry Syrup is collected from Jennifer’s own housemade Maraschino cherries. It’s a very nicely balanced drink with some sourness to it, but also a satisfying sweetness. Then, later in the meal we took down a floral and refreshing Hibiscus Margarita (while it was good, it wasn’t Kristien’s favorite), and a juicy + floral (not too sweet) Red Berry Sangria made with blueberries and wild raspberries with Grenache. But, our favorite drink of the night was the Killer Bees Knees made with Barr Hill Gin, Lemon Juice, and more of that amazing House Infused Jalapeño Honey. This is just the epitome of a summertime drink because it’s bright, has a nice lemony kick, and has just enough spice coming through from the jalapeño. The gin, too, is great and isn’t overpowering at all like gin can be in cocktails. Have we ever said how much we love going out with friends to eat? It’s not only a fun time with great conversation, but you can order a helluva lot and not feel not too bad about it. And, that’s kinda what we did, taking down nearly half of the menu. We each picked one app that we wanted and we decided to throw in the pickle jar because, well . . . pickle jar. 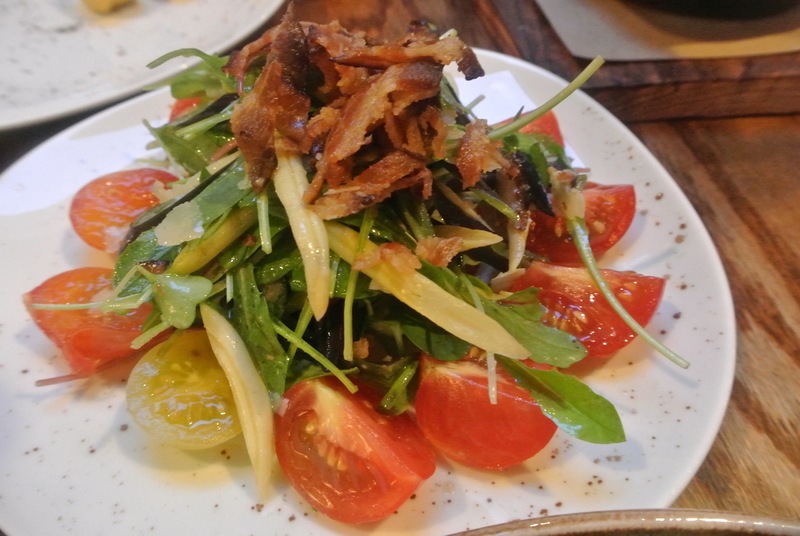 Andrew’s choice was the Heirloom Tomato Salad with Wax Beans, Parmesan, and Bacon Vinaigrette. It was obvious how fresh those tomatoes were because they were just so vibrant and sweet and the bacon added a nice smokey crunchy contrast. Mix that in with the crisp wax beans and the parm for a nice offset with fattiness, and this was a great palate cleanser for some of the heavier things we enjoyed. One such item was the Pork Shoulder which Dan ordered (and everybody wanted). 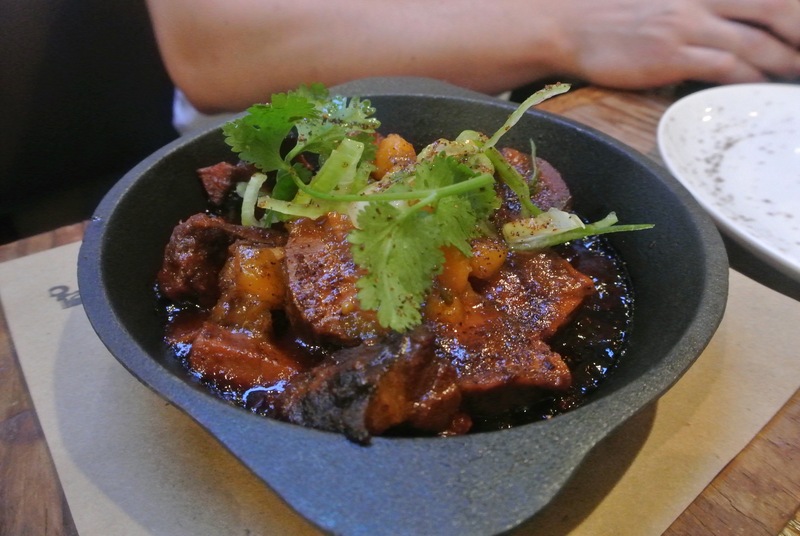 Forksize bits of pork come out on a skillet with a Stone Fruit Piccalilli (a kind of relish) that were so delicate they just flaked away with a gentle pull of the fork. Chef George DeMarsico shared that he creates his own rub, smokes the shoulders overnight (he gets a whole pig shipment from Gaia’s Breath weekly), then applies his own peach BBQ sauce. From there he cooks it in the sauce, too, to seal in the flavor. So good! Christine’s choice was the Sesame Crusted Seared Tuna that came with carrots, ginger, and watermelon tomatoes. The tuna was seared beautifully, was very fresh, and was melt in your mouth soft. 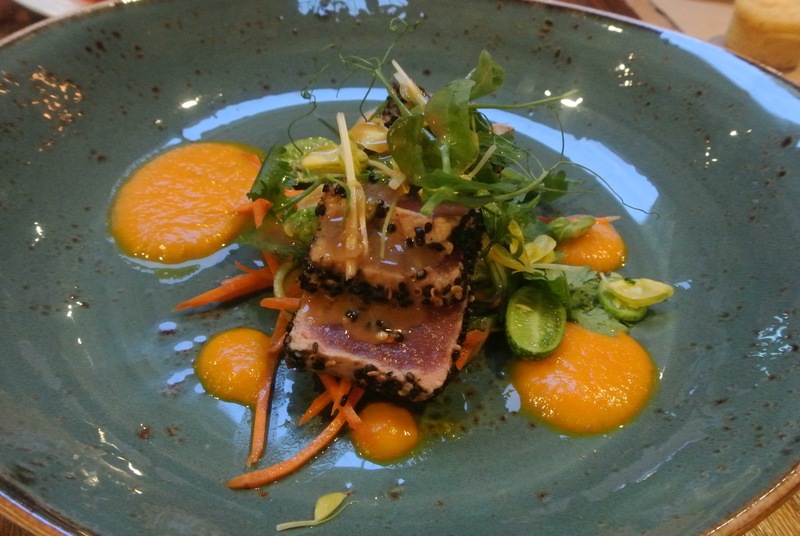 The sauce that surrounded the dish was vibrant and provided a nice contrast to the gentle nature of the tuna. Dan did feel like this dish needed more seasoning or salt, but no one else seemed to mind. Lastly, Kristien ordered the falafel which were really light and moist (made with Black Eyed Peas), served on top of a light and refreshing cucumber yogurt dip. 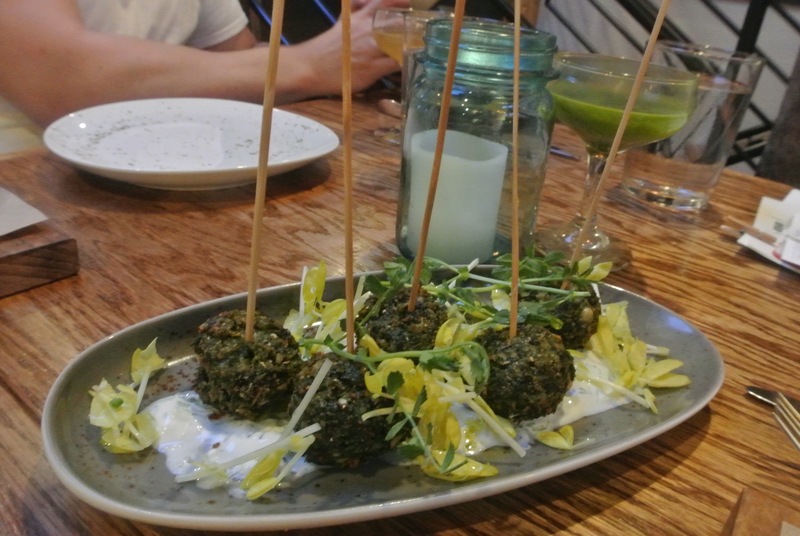 Not your typical falafel, and we liked it that way! Oh, and how could we forget the cornbread that they brought to us to start things off? They were mini-muffins that were fluffy, airy, and packed plenty of flavor, especially with their house churned Red Bee Honey butter on the side. After eating all of these, we turned our attention to the Pickle Jar. There were lots of veggies inside like turnips, celery, carrots, beet, and green beans, and they all had different tastes and textures, so it was fun to take bites and see the differences. 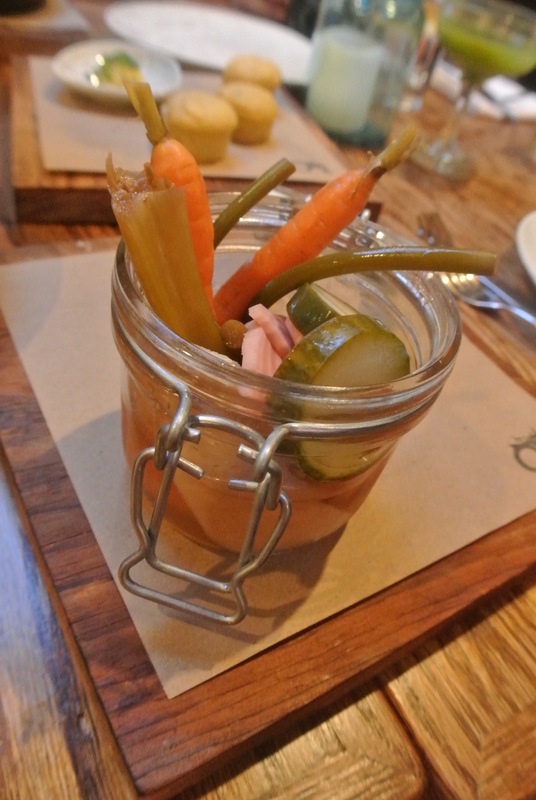 The pickling juice itself was a strong vinegar that had a spice kick to it . . . like punch you in the gut strong. For some it might be too strong to handle, but we loved it. And, we even tried to get what the spice was from Chef, but he said it’s a secret. We’re thinking it was a spice like cinnamon, cardamom, clove, or even five-spice. You try it and let us know. And, when we thought we were done with apps, a plate of the Shishito Peppers with Sea Salt were brought to our table. You know the story about these guys? They are like nature’s Russian Roulette. 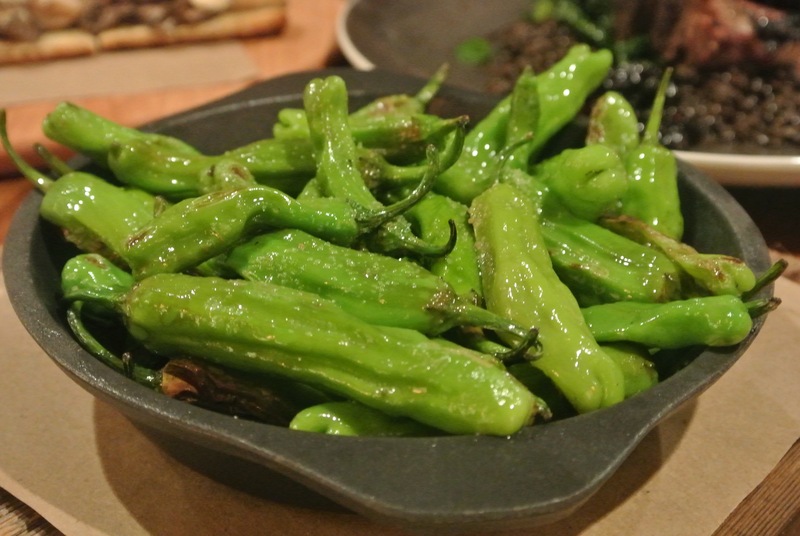 1 out of every 10 or so peppers is freaking hot, so you never know what you’ll get. Well, Andrew and Dan got ’em, while Kristien never realized her dream of getting the spicy one. But, even still, these were great peppers with nice grill marks and had nice bits of salt sprinkled throughout, adding more flavor. So, we dared not stop, but rather headed boldly ahead into the next section of the menu. 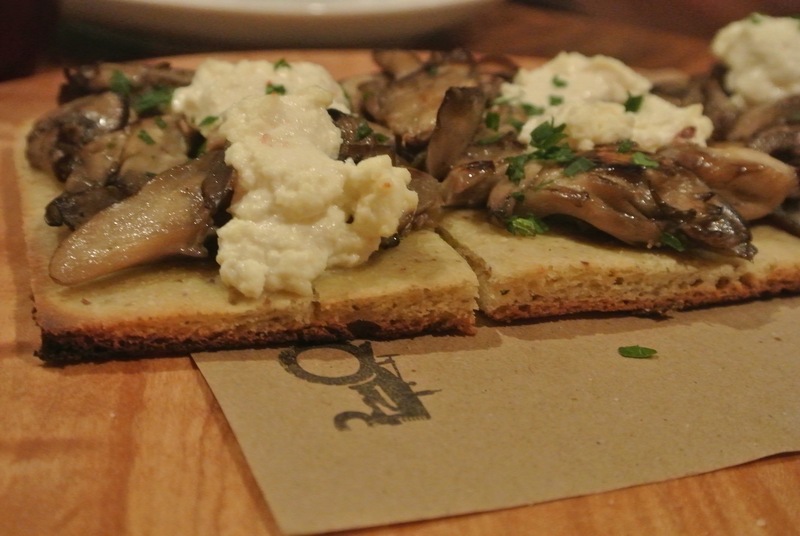 We tried the Mushrooms & Ricotta Gluten Free Flatbread to start. The topping was perfectly creamy and savory, while the crust had a very different kind of consistency. It wasn’t bad, just odd . . . we could most easily compare it to a thick kind of pie crust. Well, the reason the consistency was different was because it’s gluten-free. We were even more surprised when Jennifer shared with us that everything that they sell for dinner is gluten free (there’s some gluten for lunch because there’s bread for the burger and sandwiches). Chef DeMarsico explained that this certainly isn’t easy, but it helps him to be creative and try new things while being able to feed so many of the folks with an intolerance. Up next was the Grass-Fed NY Strip Steak that came with Roasted Fingerlings, Onions, and a Black Garlic Butter. First off, that reduction was killer. 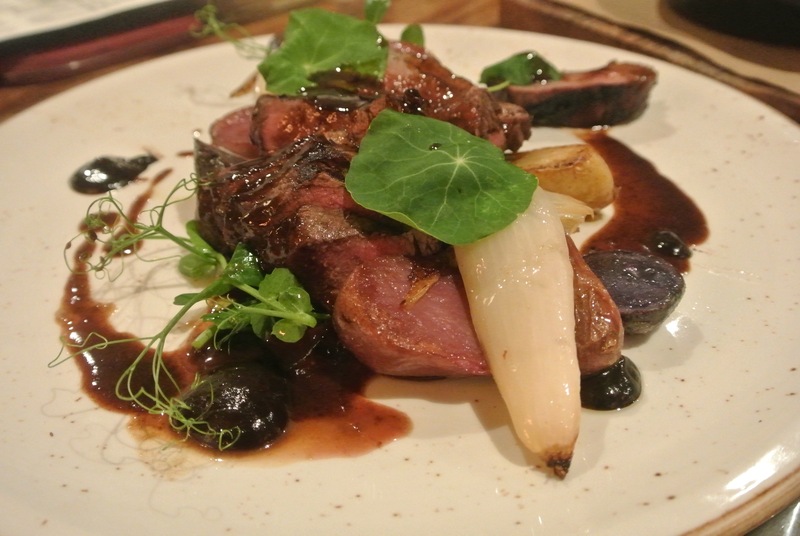 It was rich, velvety, and had such an unctuous flavor that we first thought was from a Worcestershire sauce, but Chef shared that the flavor actually came from black garlic that he fermented. The steak was cooked just like we asked (medium rare of course), the onions were grilled nicely, and the potatoes added that nice crunch and bite. This is a definite must order. We also ordered the Slow Roasted Porchetta, but, sadly, they were out, though they were able to substitute with a T-bone Pork Chop. The pork was cooked perfectly, too, bringing the meat to that beautiful pink that you want so it’s juicy and flavorful. 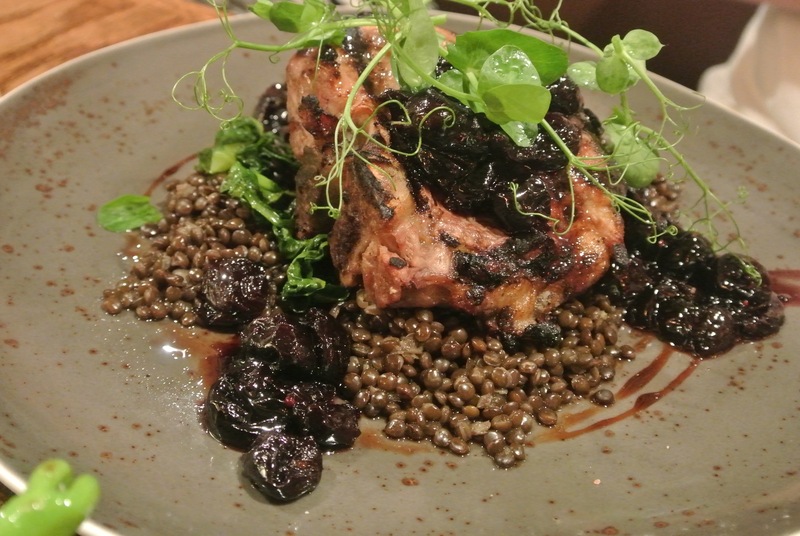 Beneath the monster chop were delicate black lentils, swiss chard, and cherry mostarda that added a fruity and slightly sour contrast to the dish. So damn good. And, finally, we made it to dessert. But, picking our two favorites (we weren’t sure if we could eat more than that) wasn’t easy, so we decided to go with our top three. 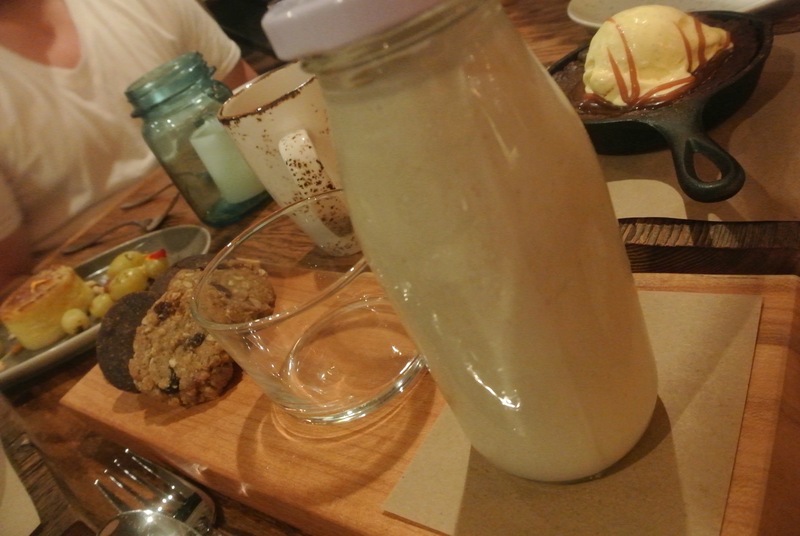 So, we ordered the Buttermilk Pie, the Blueberry Crisp, and the Vegan Cookies with Cashew Milk. As we waited, Christine, Dan, and Kristien decided to go with some Shearwater Coffee Roasters in Trumbull. While Christine enjoyed the Colombian, we loved the Guatemalan which was dark, rich, and had nice body to it. 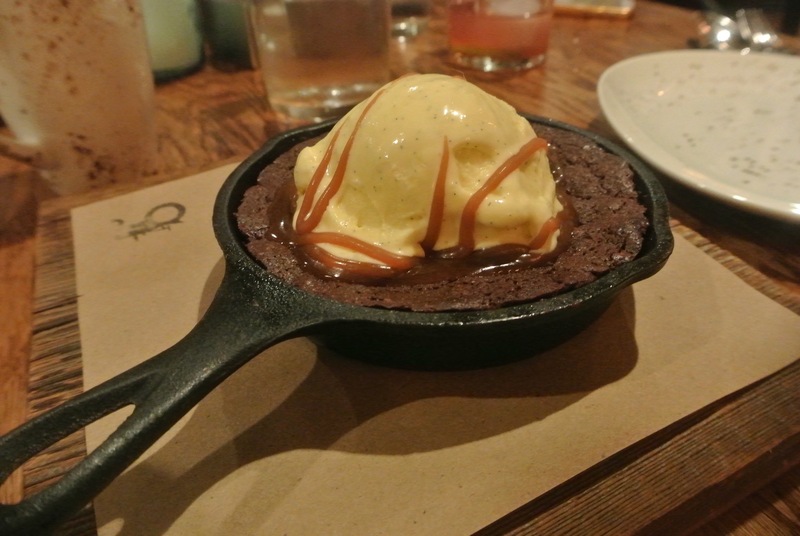 And, like that, our desserts arrived . . . with a few other additions, compliments of the house. 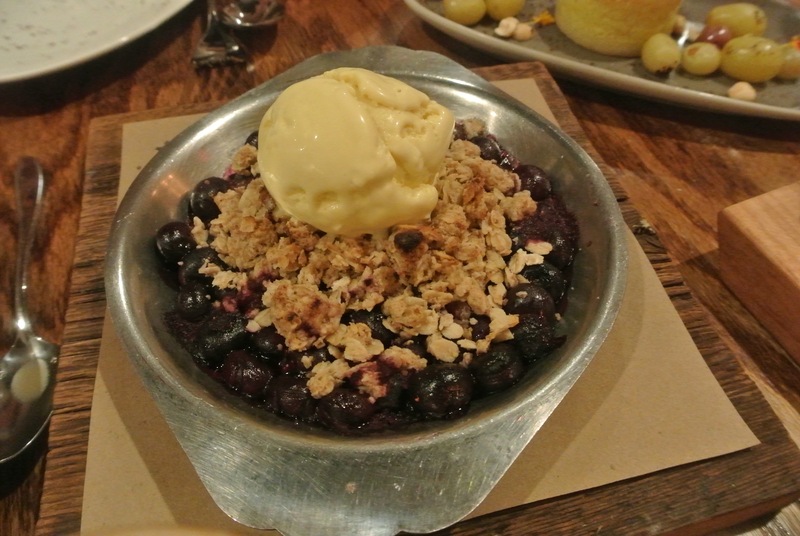 First we dug into the Blueberry Crisp because that can’t go cold, right? The top was nice and crispy and crunchy, and when we dug in there were sweet and soft blueberries awaiting us. The vegan cookies were a sight to behold and are definite items to order. There is an Oreo-like cookie made with a coconut cream center, chocolate chip cookies that were warm and toasty, and to-die-for oatmeal cookies that were crunchy and felt like home. We pushed each other through the pain and took some major bites of the brownie sundae. Honestly, we’re still amazed that this is a gluten-free dessert because it was just so moist, warm, and chocolately! We also had the Panna Cotta made with yogurt that rested on a bright and fresh basil mint syrup. The Panna Cotta itself was light, airy, yogurt forward, and very refreshing. And, finishing things up we had the Buttermilk Pie. We were all interested by this and felt like we had to try it to understand it. Unfortunately, we didn’t like this dessert because it had a very odd, strong taste and had a spongy consistency. We shared our disappointment with the dessert and Jennifer told us that it will actually be coming off the menu soon, so no worries there. There’s really something magical going on at Back 40 Kitchen and we’re so happy that it’s just a few minutes from our house. This definitely gets our attention as the best new restaurant we’ve been to this year and very well is projected to eclipse other restaurants in Greenwich and Fairfield County as the epitome of farm-to-table dining. We really can’t say it enough: get here, get some drinks, be adventurous, and take a journey. A journey from a tiny farm in the corner of CT, to Chef DeMarsico’s kitchen, then right to your table at Back 40 Kitchen. Thank you for this review!! I saw this place when it first opened but couldn’t decide if I wanted to try it or not. Now I cannot wait! Not to be picky but all of the alcohol in their cocktails are organic? Hey, not sure about all of the liquors, but just discovered that Barr Hill Gin is made with organic honey. Surprisingly good for a farm to table spot. You could probably get a few drinks, an app, and two entrees for 100 or 120. That’s great, thanks for letting me know! Sounds delicious! Excellent review! Thanks for letting your readers know there’s delicious Shearwater organic coffee brewing at Back 40! Ed, it was killer good coffee. So glad that we had some!